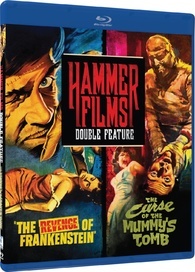 For a long period of the blu-ray age, being a Region A Hammer Horror fan was very frustrating. The most vivid hunks of monstrous comfort food were sparse in the U.S. despite being abundant in a number of other regions. That began to change last year with Warner Brothers’ release of The Mummy, Frankenstein Must Be Destroyed, Taste the Blood of Dracula, and Dracula Has Risen from the Grave. Since then, other companies have started serving famished fans such titles as Twilight Time’s The Hound of the Baskervilles, Universal’s Hammer Horror 8-Film Collection, and Mill Creek’s double features of The Revenge of Frankenstein/The Curse of the Mummy’s Tomb and The Two Faces of Dr. Jekyll/Gorgon (blu-ray upgrades of DVD sets originally released in 2008). Because all of these different companies have different business models, the presentations have been a mixed bag. Variations in picture quality can be pretty wild even among a single company’s releases. This is certainly true of Mill Creek’s new double features, which range from a pleasingly detailed and saturated presentation of Terence Fisher’s Gothic rainbow The Gorgon to the dim and dull, worn and torn presentation of his Revenge of Frankenstein. The Curse of the Mummy’s Tomb and The Two Faces of Dr. Jekyll fall somewhere in the middle. Curse easily beats Two Faces for grain and detail, but Two Faces is much cleaner and brighter than the intermittently scratchy, speckled Curse. Still, we must keep the Mill Creek model in mind. The company produces no-frills discs on a serious budget, and these new sets have been available for as little as $8.99—just $4.50 per film. Compare that to Twilight Time’s $29.99 tag for Baskervilles, which reportedly does not boast an image much better than that of Mill Creek’s Gorgon. So while Mill Creek does not offer perfectly restored presentations of films that depend a lot on how they look, they are at least very affordable, and very watchable, making it a lot easier for Region A’ers to build our Hammer blu-ray collections than it was just one year ago. As for the films, it is heartening that the best one in the bunch is also the one that looks the best. Owing almost nothing to Greek mythology, The Gorgon is really a riff on Universal’s Wolf Man with a person doomed to transform into a monster under the full moon, and Fisher’s colorful, leaf-swept visuals make this an enchanting experience. 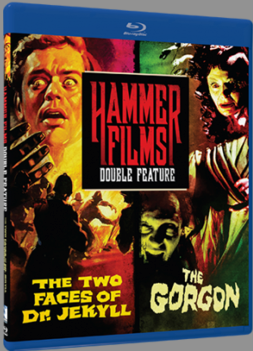 Plus The Gorgon is the only movie in the bunch to star Hammer’s two key faces, Peter Cushing and Christopher Lee. I’ll leave it up to you to decide if the rubber-snake makeup is crucial to the film’s schlocky charm or simply lame. 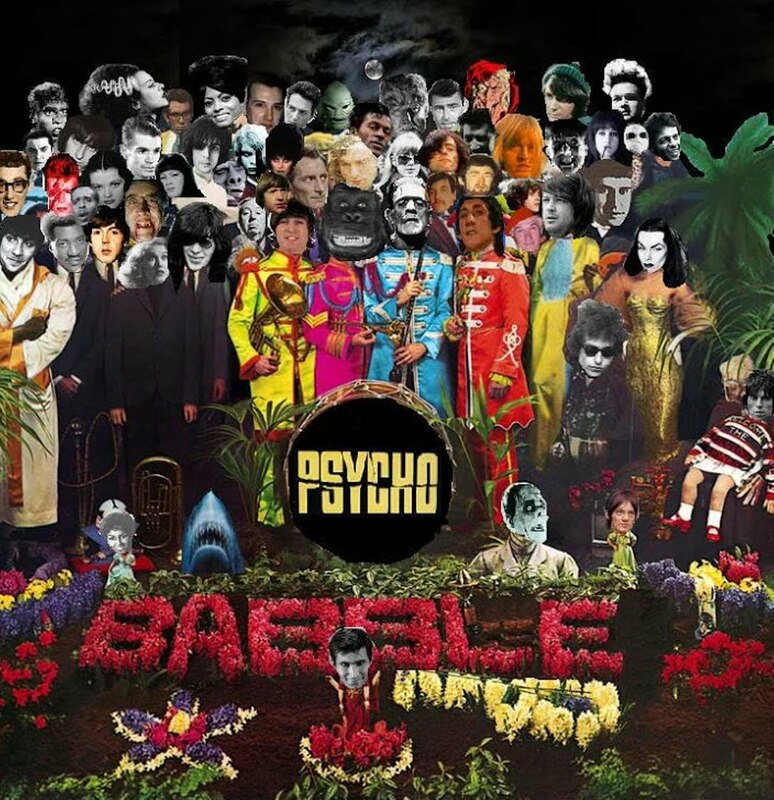 Its disc-mate, The Two Faces of Dr. Jekyll, is the worst in the bunch, a gobbledygook variation on R.L. Stevenson’s deathless tale that leans too hard on an unsatisfying gimmick. The usual appearances are reversed with Dr. Jekyll being the ugly one and Hyde being the beauty. It’s a fine enough comment on the blandness of evil, but a drag as a monster movie. Give me Mamoulian’s definitive classic in hi-def before I turn into a monster! On the other Double Feature, Curse of the Mummy’s Tomb is your usual business about tomb-desecrating capitalists getting their supernatural comeuppance from an ancient Egyptian curse. The minimal mummy time makes the majority of it play more like a thriller than a monster movie, but the final half hour is effectively gruesome and the jolly, satirical spirit makes the whole thing fun. Fred Clark is hilarious as a blowhard wannabe Carl Denham. Revenge of Frankenstein is even better. Picking up right where The Curse of Frankenstein left off, Dr. Frankenstein eludes the guillotine to continue his mad experiments under the uproariously lazy pseudonym of “Dr. Stein.” Peter Cushing reclaims the role with an extra dose of camp that spreads to the rest of the cast quicker than the clap. Jimmy Sangster’s script swells with droll witticisms. Delicious. 31 TV Shows for 31 Days of Halloween Season!